during the harshest winter months. The beach has never been much of a draw for him and he spends most of his time doing indoor activities or at his job. Joseph doesn't worry about sunscreen and only had one sunburn that he can remember and that was when he was a child. at the beach and so covering up is recommended even when wearing sunscreen. Sunscreen also wears off with sweat and water and should always be applied every two hours or after getting wet. Taking Care Of Your Skin Now Will Protect YouSadly, skin cancer can take 20 or more years to develop. The Skin Cancer Foundation states that most people receive about 80 percent of their lifetime sun exposure before the age of 18. 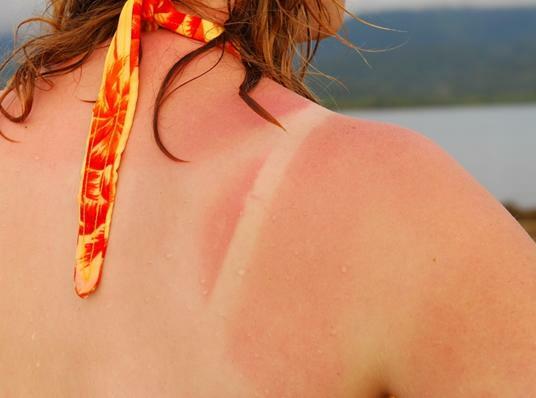 Just one blistering sunburn in childhood is estimated to double the risk of melanoma later in life. Taking better care now will reduce the risk, but not eliminate the damage already done. Having a Tan Means You're More Protected Dark skinned individuals are less likely to develop cancer, but tanned skin is actually damaged skin. Repeated tanning injures the skin and increases the risk of skin cancer. You Can't get Burned on Overcast DaysJust because the sun is hidden by some cloud does not mean that you don't need protection from the harmful effects of the suns rays.So how do you plan to protect your family this year? Some suggestions are to limit exposure to the sun - especially for infants. Examine your skin for early signs of damage. Use a sunscreen of SPF 15 or higher and apply it at least 30 minutes before exposure and every two hours after that. Teach your children good safety habits and be sure you and they are covered up when outdoors. Have fun and be safe.The information contained in this article is for educational purposes only and is not intended to medically diagnose, treat or cure any disease. Consult a health care practitioner before beginning any health care program.